The Senate confirmation hearing for Brett Kavanaugh, U.S. President Donald Trump's Supreme Court pick, opened in chaos on Tuesday as Democrats complained about Republicans blocking access to documents stemming from the nominee's previous work in the White House under President George W. Bush. 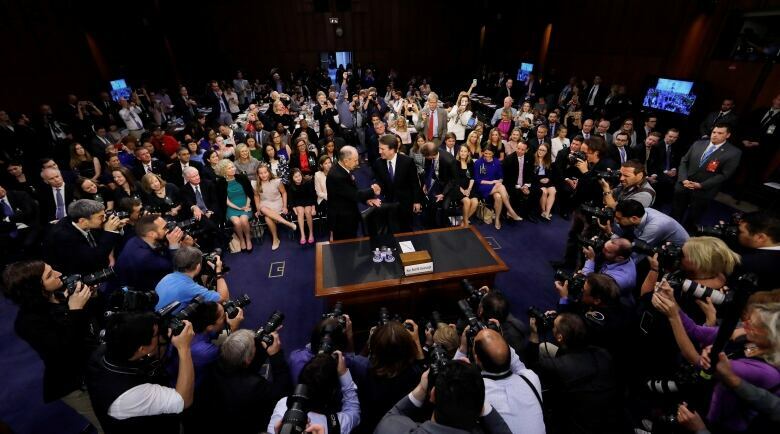 News photographers clicked pictures of Kavanaugh as he entered the hearing room. Democrats raised objections from the moment chairman Chuck Grassley brought the committee to order and asked to have the proceedings adjourned. They want to review 100,000 documents about Kavanaugh's record being withheld by the White House as well as some 42,000 documents released to the committee on a confidential basis on the eve of the hearing, along with others not sought by Republicans on the committee. Grassley denied the request to adjourn, but the arguments persisted. "We cannot possibly move forward. We have not had an opportunity to have a meaningful hearing," Democratic Sen. Kamala Harris said, while Sen. Cory Booker appealed to Grassley's "sense of decency and integrity." "What are we trying to hide? Why are we rushing?" asked Democratic Sen. Patrick Leahy. More than a dozen protesters, shouting one by one, also disrupted the hearing at several points and were removed by police. "I think we ought to give the American people the opportunity to hear whether Judge Kavanaugh should be on the Supreme Court." The American Bar Association has given Kavanaugh its highest rating — well qualified. Republicans have released some but not all of the existing documents concerning Kavanaugh's two years as a lawyer in the White House Counsel's Office prior to becoming staff secretary. If confirmed by a Senate controlled narrowly by Trump's fellow Republicans, Kavanaugh is expected to move the court — which already had a conservative majority — further to the right. Senate Democratic leaders have vowed a fierce fight to try to block the confirmation of the conservative federal appeals court judge. "This entire process has cast a cloud over Judge Kavanaugh's nomination. Democrats strongly object to moving forward when so much of his record remains secret," said Sen. Dianne Feinstein, the senior Democrat on the judiciary committee that is conducting the confirmation hearing, due to run through Friday. "We are shocked at the efforts being undertaken to jam this nomination through and hide his record from the American public. We go to these hearings under protest," Feinstein added, standing in front of the Supreme Court building with her fellow Democratic committee members before the hearing. Republicans have said that Democrats have more than enough documents to assess Kavanaugh's record, including his 12 years of judicial opinions as a judge on the U.S. Court of Appeals for the District of Columbia Circuit. They have accused Democrats of seeking to delay the hearing for purely political reasons. The hearing gives Democrats a chance to make their case against Kavanaugh ahead of November's congressional elections. 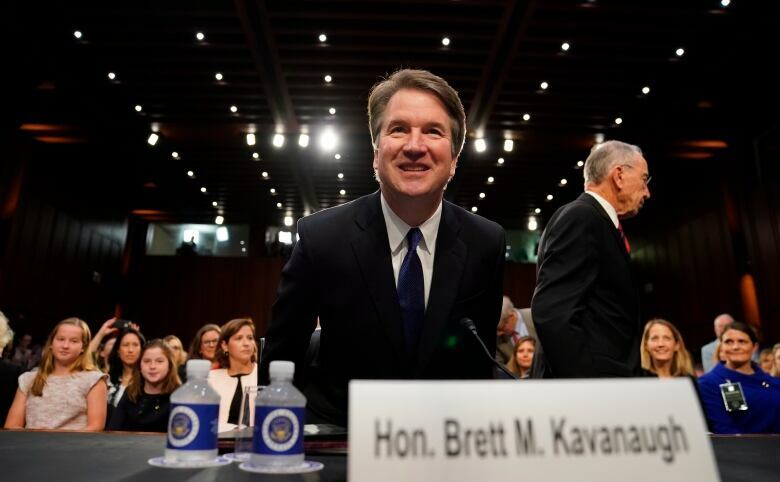 "A good judge must be an umpire — a neutral and impartial arbiter who favours no litigant or policy," Kavanaugh​ said in prepared opening remarks. "I don't decide cases based on personal or policy preferences." Trump nominated Kavanaugh, 53, to replace Justice Anthony Kennedy, who announced his retirement on June 27 at age 81. He is Trump's second nominee to a lifetime appointment to the nation's highest judicial body. Trump last year appointed Justice Neil Gorsuch, part of his push to make the courts more conservative. Kavanaugh spent four years working for Kenneth Starr, the independent counsel who investigated former Democratic president Bill Clinton in the 1990s. Kavanaugh also spent more than five years working for George W. Bush when Bush was the Republican president. In 2009, many years after the Starr inquiry, Kavanaugh wrote a law review article saying presidents should be free from the distractions of civil lawsuits, criminal prosecutions and investigations while in office. As a judge, he has amassed a solidly conservative record since 2006 on the influential U.S. Court of Appe​als for the District of Columbia Circuit. With Sen. John McCain's death, the Republican Senate majority shrank to 50-49, but McCain's replacement is likely be seated before a final vote on Kavanaugh, restoring the majority to 51-49 and providing the votes needed for confirmation. Liberal activists have pinned their slim hopes to block Kavanaugh on two Republican senators who support abortion rights: Susan Collins and Lisa Murkowski. 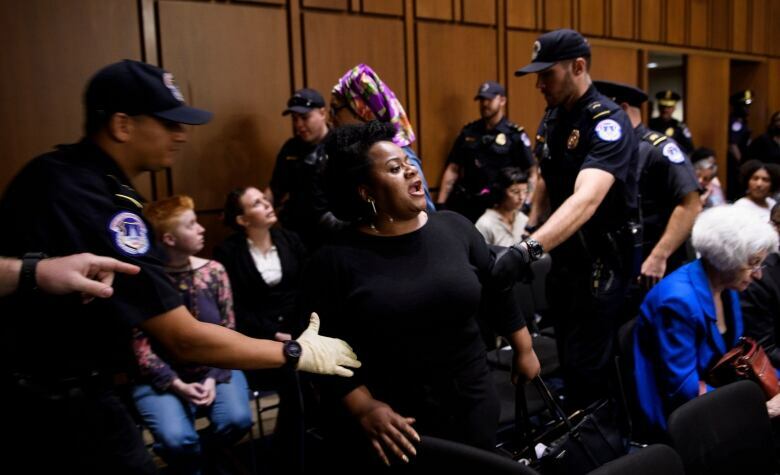 So far, neither has indicated she is likely to oppose Kavanaugh.